Real Bread Campaign | what? bread? The Real Bread Campaign has a definition of real bread that includes what is and what is not included. These are the principles that I aim to follow with my baking. 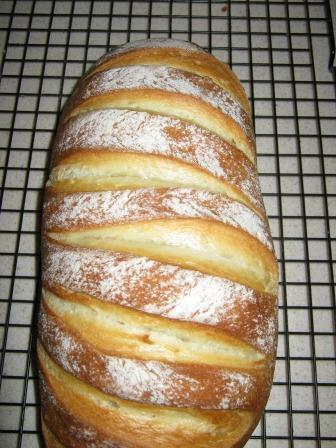 I got tired of 50:50 and other pappy shop-bought long-life loaves that cost a fortune. Baking, even with supermarket ingredients is cheaper and tastes better. On this site I’ll try to list all the things I put in my baking and refer to the sources of inspiration and recipes I’ve used. Currently I source my ingredients from the major supermarkets near where I live, so the choice is usually Sainsbury’s, Tesco, Waitrose, or the Co-op, with occasional forays off-piste into ASDA or Morrison’s, Lidl or Aldi. Dan Lepard says it’s OK to use supermarket flours as the basis for loaves so that’s cool with me, although I have been trying some of the less common flours as part of a loaf. Additional ingredients are great as long as they are natural (e.g. seeds, nuts, cheese, herbs, oils, fats and dried fruits) and contain no artificial additives. If you add anything but salt to butter, you have to call it something else; if you add anything at all to milk, it’s no longer milk. So why does similar legal protection not apply to that other staple food: bread? The making of what we call Real Bread does not involve the use of any processing aids, artificial additives, flour ‘improvers’, dough conditioners, preservatives, chemical leavening or, well, artificial anything. 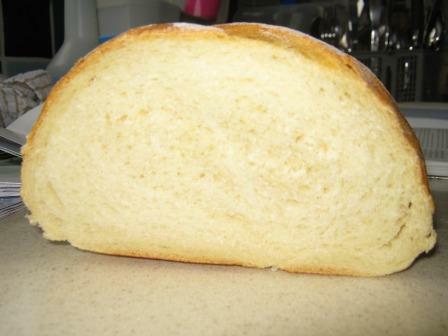 Which is more than can be said for many of the products out there that are marketed as bread. E481 (sodium stearoyl-2-lactylate), E472e (mono- and diacetyl tartaric acid esters of mono- and diglycerides of fatty acids), E920 (l-cysteine), E282 (calcium propionate), E220 (potassium sorbate), E300 (ascorbic acid), E260 (acetic acid) soya flour, vegetable fat and dextrose are just some of the other things that you might find in an industrial loaf. What’s more, its production also could have substances including phospholipase, fungal alpha amylase, transglutaminase, xylanase, maltogenic amylase, hemicellulase, oxidase, peptidase and protease but legally, the manufacturer wouldn’t have to declare so on the label. This could apply to a wrapped/sliced factory loaf or one from a supermarket in-store bakery. The latter does not even have to have an ingredients label to help you make an informed choice. 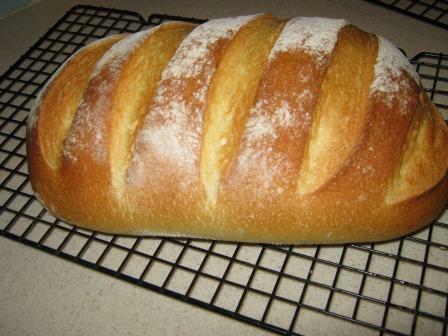 My first blog entry is about some bread I made today. I’ve been exploring the ideas of the Real Bread Campaign for a while now and getting quite good at using recipes by the fabulous Dan Lepard. 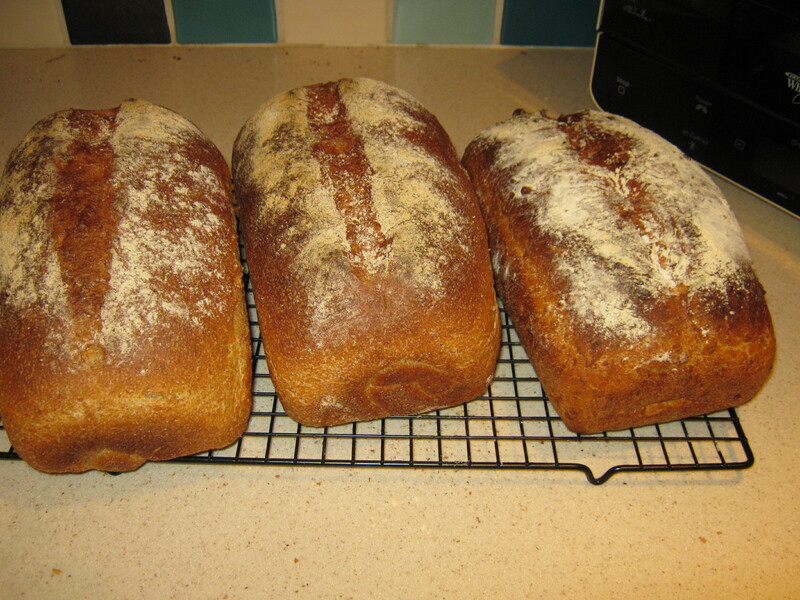 Today I made two loaves of 60:40 wholemeal:white and one multigrain and honey loaf. The 60:40 is something I make regularly from Dan Lepard’s book “Short and Sweet“. The loaf contains water, flour, fresh yeast, salt, brown sugar, sunflower oil and to give it some whoosh a vitamin C tablet. I double up the quantities and make two of these at a time. Everything goes in the bowl together and it couldn’t be easier. 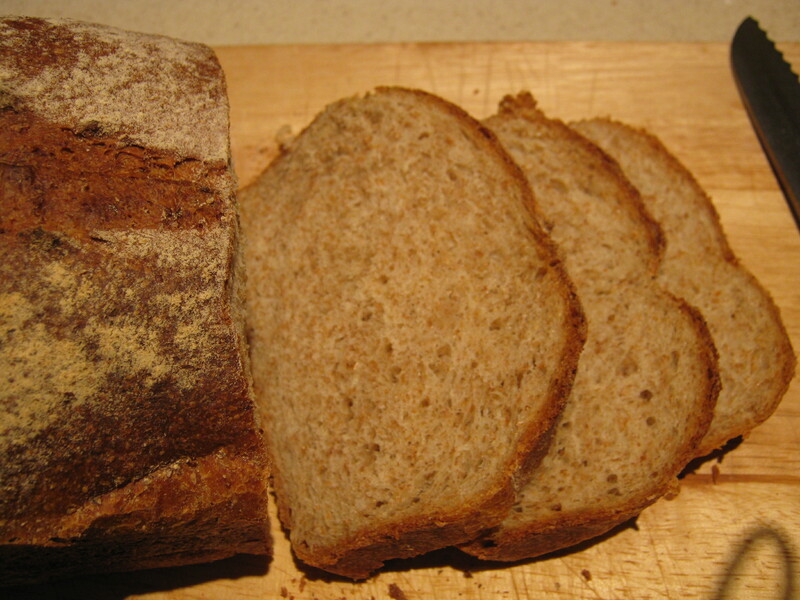 The multigrain and honey loaf is another of Dan’s recipes. This one uses the sponge method. In the morning I mixed up the water, some white flour and the yeast and left it to start fermenting while I went to work. In another bowl I mixed what Dan calls the porridge – some oats, honey, linseed seeds, sunflower seeds and water. When I wanted to start making the bread all I had to do was to rub some butter into some flour, both plain and wholemeal, add some salt and then mix in the sponge and the porridge. Dan’s recipes use a method that doesn’t involve heavy kneading, just gentle folding and resting at intervals. And the results seem to turn out OK. Here’s some of the 60:40. I have started a sourdough starter using rye flour and water and hope to have some results to show for it soon.